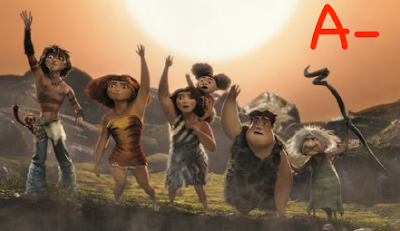 “Grug” (Nicolas Cage), the caveman, is the proud head of his prehistoric family. He boasts that while so many other relatives have kicked the bucket from disease, giant beasts, tar pits, and the like, he found a cave to hide in. The cave is Grug’s answer to every problem. It protects them all from nearly everything, but it can’t protect them from what is to come. When Grug’s oldest daughter “Eep” (Emma Stone) ventures outside one night to investigate a mysterious light, she meets an inventive young man, “Guy” (Ryan Reynolds), who is like none other she has ever met. He brings with him something special. It’s like a small sun that makes finding things in the dark much easier and has the added benefit of keeping the beasts away. While the new and perilous circumstances will try them all, the young and promising Guy – with his wisdom and continual stream of ingenuitive ideas – is set on a collision course with Grug, which makes us ask: Will this family, like so many others before it, fall prey to a harsh and unforgiving world, or will they be the next to balance safety and risk to advance their species and move onto new discoveries? What isn’t new is the film’s immediately identifiable formulaic setup. It isn’t like we can’t quickly see where things are going from the beginning. It just so happens to be that the lessons it has to teach are wonderfully needed and always relevant, allowing us to welcome them instead of roll our eyes. The opening childish antics that seem to be targeting frustrated preteens and the incorporating of modern comedic expressions and phrases don’t do a lot to hurt the movie. In fact, they should by now be expected. 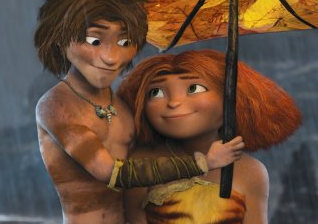 The longer we watch, the more convinced we become that The Croods has what it takes to provide entertainment in a personable and philosophically meaningful way. While having plenty silliness and bizarre exaggerations for the kiddies, the film’s hilarity otherwise weighs in most respectably for older viewers in a narrative that resists sagging and quickly pushes through several melodramatic drop-offs. And unlike many cheaper productions, this one never resorts to “bathroom” humor, doesn’t eat up screen-time with mindlessness, and it doesn’t run too long. 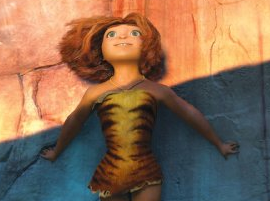 Inventive and moving, The Croods is an animated win-win from Dreamworks.